A member of the University of Wisconsin System, UW-Stout serves over 9,500 students in 20+ graduate programs, including two terminal degrees and 45+ undergraduate programs. 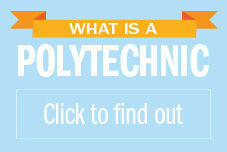 Polytechnic schools are career-focused, combining applied learning and liberal arts. UW-Stout emphasizes “real-world,” hands-on learning experiences that result in a 98.7% placement rate (employed or continuing education) for our graduates. We have twice as many labs as classrooms, required co-ops and internships for most programs and extensive collaborative projects with industry and our community. UW-Stout aims to cultivate an environment that fosters and promotes diversity, equity, inclusion, and accountability at every level of university life. We value diversity intrinsically and for the benefits it brings to our community. We strive to create learning environments in which students, faculty, and staff of all backgrounds can thrive and fulfill their academic, personal, and professional potential in an increasingly diverse global environment. We’re also a leader in sustainability and energy efficiency with a STARS Silver Award ranking. We encourage and participate in extensive recycling, composting and water conservation programs, campus garden, campus building energy use dashboards, free bus transportation, CarShare program and other initiatives.